The Blue Rhino range of single width, single inlet (SWSI) centrifugal fans features a backward-curved laminar impeller and a heavy duty, fully welded construction. Their innovative design integrates a Variable Speed Drive (VSD) which eliminates the need for a high maintenance belt and pulley system. They are driven by a direct drive motor and are available with a long lasting hot dip galvanised finish or durable blue powder coating. The range is available in 15 impeller sizes, extending from 12 inch (305mm) to 44 inch (1120mm) diameter. Smaller sizes come in a box type design and larger sizes with a pedestal mounted motor. Fully welded mild steel casings. Hot dip galvanised or blue powder coated finish. Impellers are fully welded. Backward-curved laminar impeller. Electricity supply – three-phase to suit a wide range of voltages and frequencies. 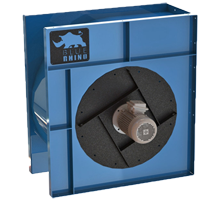 The single width, single inlet (SWSI) centrifugal fans shall be of the Blue Rhino series as designed and manufactured by Fantech Pty. Ltd. and be of the model numbers shown on the schedule/drawing. The housings and impellers shall be made from fully welded mild steel with hot dip galvanised or blue powder coated finish. Impellers shall be backward-curved laminar design, rotating clockwise unless specified otherwise. They shall be driven by a direct drive motor and designed to operate with a Variable Speed Drive which can be factory pre-configured to suit the application. They shall be fitted with inlet spigot and discharge flange, and come standard with inspection hatches and drain plugs. Air flow data shall be based on tests to ISO5801:2007. Diagram shown is for single-speed only. For 2-speed and special motors, contact Fantech for details.